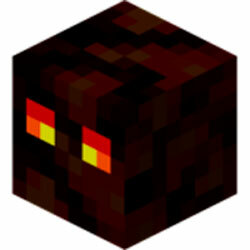 The Magma cube is an hostil character who lives in the Neter’s dimension. They are exactly the same as normal Smiles size and behaviour, however apperently they have differences like red and orange eyes and its obdy is a mixture of brown, red and black. When these beings are attacked by a player they will divide in sections, multiplying itself in other beings smaller then the first one. It will follow any detected player. It stretchs and contracts its body to make jumps in order to move and its attack is jump on the player. Magma cube normally appears both in the fortress of the Nether and it’s surroundings.